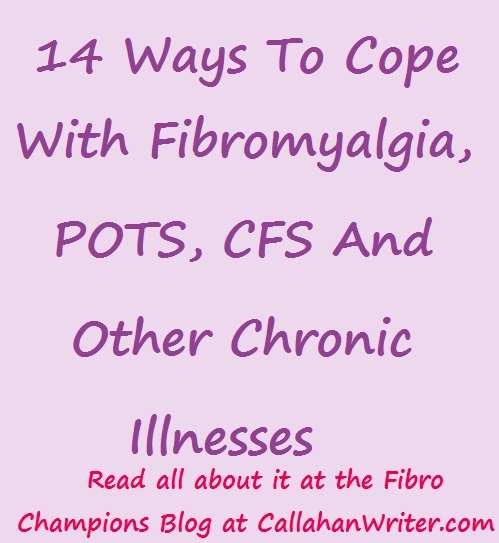 14 Ways To Cope With Fibromyalgia, POTS, CFS And Other Chronic Illnesses | Troy C. Wagstaff aka CallahanWriter Blog: Topics of interest include Western Historical (1865-1899) Topics. Additionally inspirational Christian and Fibromyalgia interests. Let go of the guilt that comes from not being able to do what we once did. Having fibromyalgia or any chronic illness is not something we sought after. We didn’t ask for it. It just happened to us. For whatever reason we were imposed upon by this illness and its debilitating effects. It’s like being victimized. It’s something that happened to us through no fault of our own. We can’t be held responsible for having fibromyalgia, POTS, Chronic Fatigue Syndrome or any number of the chronic invisible illnesses. We need to stop feeling guilty and we need to stop feeling responsible for having this illness. We didn’t ask to have any of these chronic illnesses. So how do we move beyond the confinement that fibromyalgia imposes upon our life? Most people experience guilt because they are no longer doing what they used to do. The guilt comes from letting people down who continue to expect us to perform at the same level we did prior to fibromyalgia or chronic fatigue. We feel guilty for agreeing to do something for someone and then can’t live up to other peoples expectations of us. Living with fibro you know that symptoms can rise and fall on a daily basis. We have no control what this afternoon will bring or what tomorrow morning will bring. We can wake up one morning feeling good and by the time we shave, shower and eat breakfast we begin to feel weak from the pain and exhausted for no good reason and can’t remember what you ate for breakfast. All our plans for the day are shot. That makes many people feel guilty and guilt causes stress and stress can easily contribute to feeling worse. Guilt has its place in life, but not for the way we are forced to live as fighters and survivors of fibromyalgia. If we commit a transgression we should feel guilt, but we do not need to feel guilty for letting people down because we are in too much pain to move about or we are too fatigued to get off the couch or out of the bed. For those kinds of things we do not need to feel guilty as it will only compound our pain, fatigue, fog or other symptoms. GET RID OF THE GUILT! How do I give up my old life? First of all, you’re not giving up your whole past. You’re just giving up on what you can no longer do and you need to learn what you can do. There are a lot of things you can do to give you a sense of purpose and fulfillment. Understand what you can and cannot do. Consider keeping a journal to learn how you deal with the circumstances of your life so you can learn and fine tune your new outlook on life. Maybe you can’t go hunting anymore, maybe you can’t move the refrigerator out to clean behind it anymore, maybe you can’t do all the housework and laundry and spend time with your kids like you used to. So focus on what you can do. Forget the fridge because perhaps you can sweep the kitchen floor. Maybe parts of your house may need to be untidy, so you can spend time where it matters most, with your children or your spouse or friends. Remember, with fibromyalgia, your new reality is to reexamine your priorities because you can’t do it all. Look at your life and tasks, and go into it like you are negotiating a special deal. I can’t do this . . . but I can do this . . .. I can’t sing in the church choir, but I can still go to church. This is the way you need to think. Don’t give up on life altogether. Just rearrange it. Compromise the events of the day. Now you see why letting go of the past limitations is important you can identify a new approach to living your life. Create new goals unfettered with past goals and achievements. Let your goals be based on what you can do with understanding your limitations. When setting goals, some people like to add to their goals step by step procedures for achieving goals. If you make your goals that way leave A LOT of room for each goal because you may have a day here or there that puts you in bed or on the couch in front of the TV or if you’re lucky a good book. There might be flare ups that last a week or a month. If you allow time in between your goals, then you won’t be as inclined to feel bad about not getting your goals done in a timely fashion. You need to have flexibility built into your goals and then you need to reserve the right to modify them according to your ever changing circumstances. Always remember there is always room to grow even when the pain seems to be getting the better of you right now. That’s why goals are important, they keep you focused on what you can do. Let’s look an example; You’ve wanted to read a certain book that is 1200 pages long but never had the time. You set a goal to read it. You give yourself six months to read it. 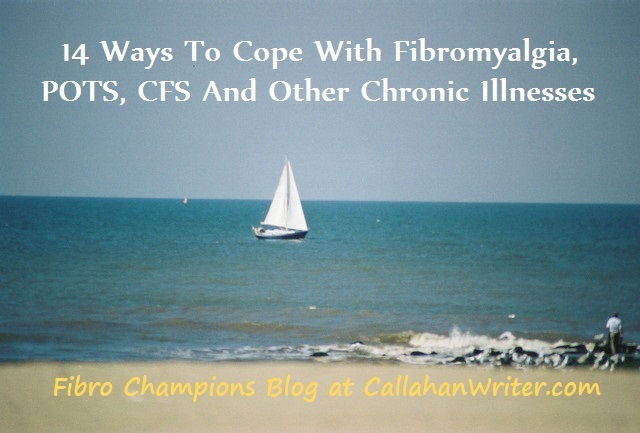 But, as we all know, who suffer from fibro, things happen. Pain happens, fatigue happens. With fibromyalgia, a lot of things can happen that can take your eye of your goal. You have written down the goal and it is where you will see it, so that it will remind you what you’re trying to do. You’re working on it diligently, but life happens, AKA, fibro happens and six months have come and gone and you’re only on page 578. “We have fibro we gotta stay flexible,” so you say to yourself, “if I didn’t have that goal or reading that book I may never have started. Now I am at page 578! Yey!” Now you exercise flexibility and say “in the next six months I will finish that book. The next half years comes and goes and it is a little better than the past six months and you’re able to finish the book. That’s what flexibility is all about when you make goals. Communicate your issues and your desired changes with your family and close friends. Look at every important person in your life. Realistically look at them and determine what they’re capable of in supporting you. And then cut those expectations in half so that you won’t be disappointed in them. Adjusting to your new environment doesn’t mean you are giving up on fibro. You still are seeking medical help in managing your illness and ease your pain and other symptoms. There is room to grow in your new life. Another thing about goals. Look at your old life and see what your goals were. Can they be modified and brought into your new life? If they can, then outline what needs to be done to achieve those goals and how they need to be modified. If they can’t be achieved then look back on your past and see if there are other interesting things that were put on the back in your old life and see if they can be brought back to life in your new life. If not, seek new goals based on your past experiences or new desires for achievement. Keep an open mind. While there are definitely things you cannot do, there are things you can do. It’s kind of like growing up all over again. We need to stay open and positive and try new things to test our limitations. Sometimes keeping a journal will help keep track of these things.